So I thought it was about time we did a little update of our 'Favourites Shelf' and I had intended it to be a Spring Edition but the weather doesn't seem to have got the message as Spring hasn't really arrived yet has it? But our Favourites Shelf isn't really a seasonal thing anyway so I'll just share the books we have read most over the last few months because lack of Spring sunshine means more cosy reading days doesn't it?! The Wee Page Turner has really been enjoying books about lions recently! The first book he ever really engaged with was the 'That's Not My Lion' touch and feel book. When we started reading this he started to giggle on the final page (I believe at first it was the silly voice I did when we finally identified the correct lion). And then he started to anticipate the fun of that final page and would try to turn through the pages quickly to get to the last one! I love this series of books, though I sometimes find the touch-and-feel elements a bit hit and miss as they are better in some of the books than in others. 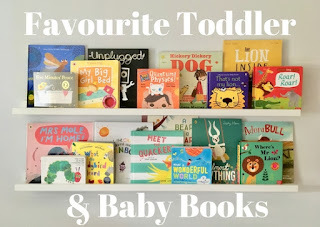 I recommend borrowing a few from the library to see what they are like, or checking them out in a bookshop rather than buying online as we have found a few disappointing (That's Not My Fairy for example). Having said all that, the lion one is an excellent one! 'Where's Mr Lion?' is part of a fabulous series of books where the flaps are made of felt fabric so that little ones can pull at them even before they have the fine motor skills to manipulate card or paper pages. The illustrations are bright, colourful and high-contrast so little ones will really enjoy them. And the final page has a mirror hidden underneath the flap that The Wee Page Turner giggles at in delight of the handsome baby looking back at him. He usually kisses it! We have a few in the series and The Wee Page Turner loves them all. We have read the lion one most as I think he rather likes lions at the moment! 'Can You Say it Too? Roar! Roar!' is a great story to read aloud making silly animal noises along the way! With paper-flaps (that The Wee Page Turner can lift) this is one of a brilliant series that encourages little ones to engage with finding the creatures under and behind each flap. The illustrations are bright and colourful and instantly appealing for little ones. The animals are easy to recognise and all look adorable and friendly. The scenes also provide discussion with other animals in the illustrations and changing weather patterns and details. Deceptively simple, they are simply very clever! This is our favourite one because we love the roar roar of the lion and the snort snort of the hippo noises best. But there are so many in this series you can choose any habitat you like and find almost any animal you desire! This one is a book that we had kind of forgotten about as I had lent it to a friend to read with her class at school but as soon as BookBairn saw it again it was requested for bedtime story again. And again. And again. 'How the Crayons Saved the Rainbow' is about the Sun and Clouds who were best friends, working together to make those rainbows that make us all smile at their colours! But one day the Sun and the Clouds have a big fight and they stopped being friends and wouldn't be in the sky together any longer. And that meant no more rainbows and without the rainbows the world started to lose it's colour until the Earth was only black and white. Except, that is, for one little forgotten box of crayons. These beautiful and brave little crayons set out to restore colour to the Earth by save the rainbows. The illustrations in this book are also wonderful! The whole thing looks like it has been drawn in crayon which, artistically appeals to me and to BookBairn it looks sort of like her drawings. Clearly, the use of colour in this book in incredibly important and the pages that are simple black and white are not without their charm but it's the rainbows that really are the star of the show. As it should be! This book recently featured on my wish list of books and I was delighted when my friend sent me a copy for BookBairn. The day it arrived in the post, BookBairn took it to bed that night. Certainly a seal of her approval. And, as you know, she has very exacting tastes! 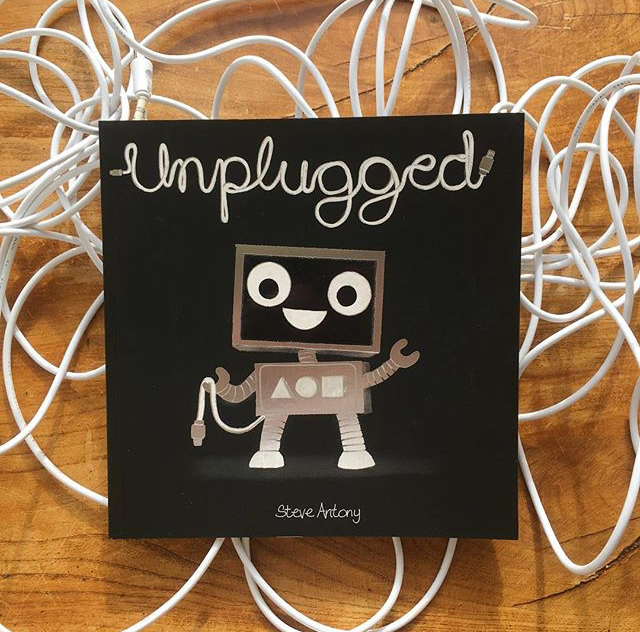 'Unplugged' is the story of Blip, a little robot who spends all her days plugged into a computer learning new things, exploring new places... online. When one day there is a power cut and her world is thrown upside down, down the stairs and out the front door. Into the great outdoors. Where she makes new friends, explores new places, learns new things and plays. Outside. 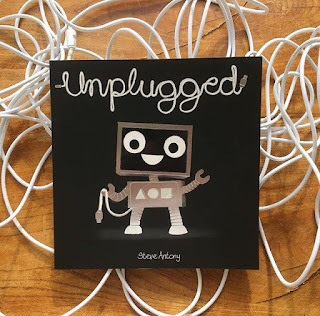 Unplugged. Such a wonderful story about finding joy in the little things, about putting technology aside and looking at the world around you. And the illustrations are wonderful too. It's hard to imagine how a computer could be cute but she is! And, although not the point of the story, it's great that Blip is a girl as I think traditionally it would have been assumed that she was a male character. 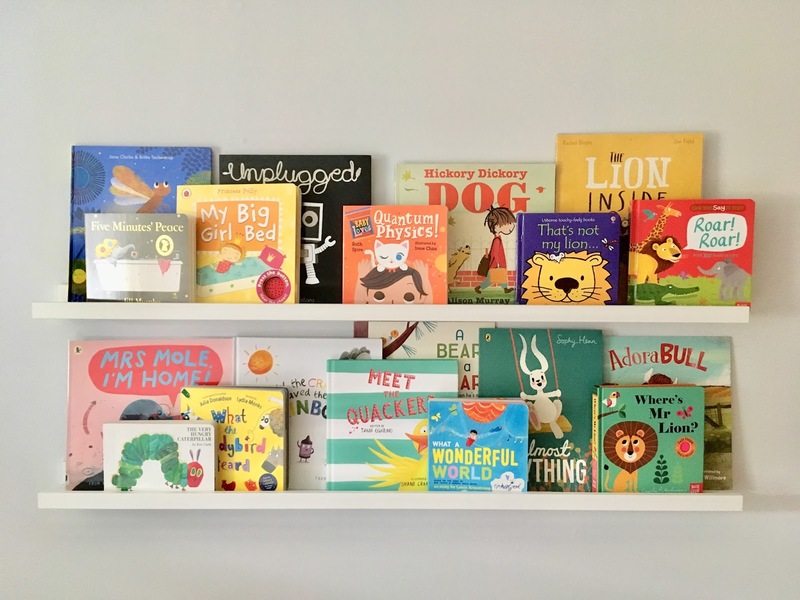 Even today male characters are twice as likely to take leading roles in children’s picture books according to recent research by the Observer newspaper. Not only that male characters were given more speaking parts, were portrayed in more masculine roles and, shockingly, in a fifth of books (of the top 100 sellers in 2017) there were no female characters at all. So yay for Blip fighting the norm! This book was one of our February Little Loves and for a while we were reading it four to six times a day! So obviously I had to include it here in our Favourites too! 'Hickory Dickory Dog' by Alison Murray is a brilliant take on the nursery rhyme we are so familiar with. It's about a boy, Zac, and his dog, Rufus and what they get up to in a day. The illustrations are charming and capture the fun and mess that these two adorable characters get up to. But the genius of this book is that it's all told in the style of the traditional rhyme without sacrificing the story to fit the rhyme scheme. One of my favourites to read (sing) aloud! 'The Lion Inside' became one of our favourites when I recorded an episode of Cbeebies Bedtime Stories (so that I could use the bedtime song at my leisure to announce bedtime whether it be 7pm or not!) and it happened to be the story on the beginning. And BookBairn quite enjoyed it as it was about a lion. And then on a library visit with a friend, I noticed that she and her daughter were returning this book and I snapped it up, making it bedtime story every night that week! It's about a mouse who wants to be noticed rather than stomped and sat on and so he decides to learn to roar like a lion. But when the lion is confronted with the mouse he has a rather unexpected reaction. When the two team up to conquer their fears they realise that friendship is what makes them roar! It's a wonderful book about accepting the strong and weak parts of yourself and creating friendships that are supportive. With Jim Field's (read BookBairn's interview with Jim Field here) illustrations this is such a wonderful book (and TV story!) and it will be a while before we return it to the library! 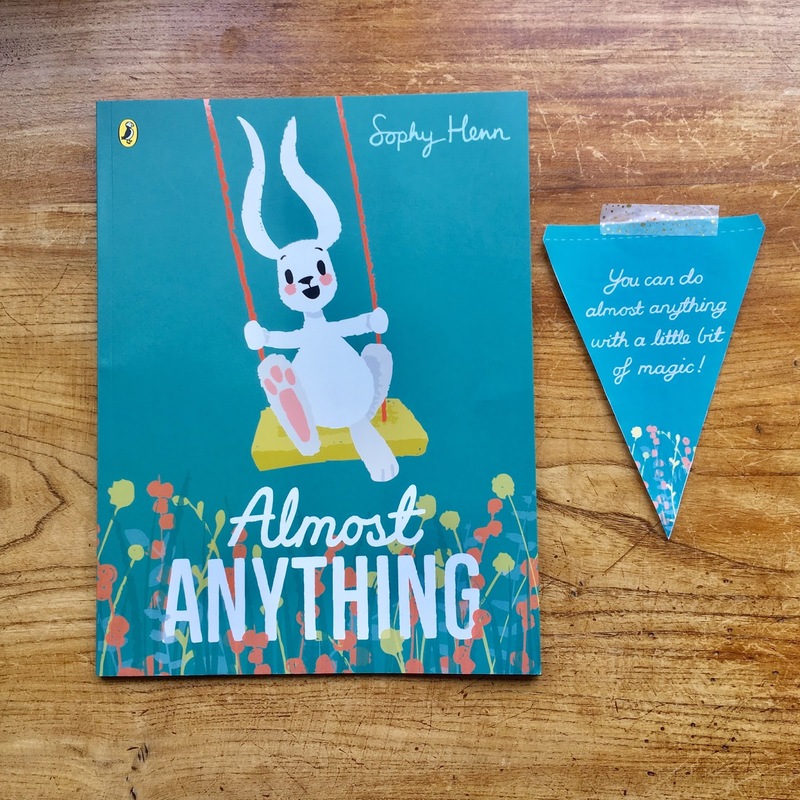 This is a magic picture book that I chose for my pick in the Bookstagram Choice Awards this quarter and so I simply had to include it in our favourites too! 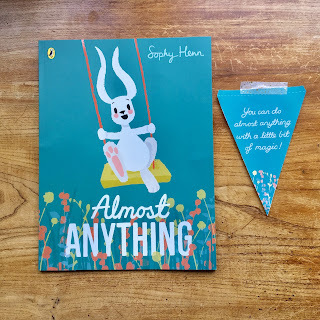 In 'Almost Anything', George feels like he can't do anything at all. George thinks he can’t paint, bowl, dance or skate like his friends and he’s too afraid to try. Bear makes him a magic hat to give him the courage to try and when he does it turns out he can skate, and dance and read and a whole host of other things! But then George loses his hat, and his confidence with it. How will he be able to join in with his friends? If he can't do all the new things he has learned how will he have fun? So Bear tells him the truth: the magic didn’t come from the hat, it came from inside. See I told you it was a magic story! And you will know that we just love Sophy Henn's illustrations as I have raved about them many times before! So that's our favourite read over the spring (I haven't included our Springtime and Easter reads because we shared those with you already). What have you enjoyed reading recently? And do you have any recommendations for us to read next? I'd love to know your favourites! *Disclaimer: Some of these books were sent to us by publishers for review and others are ones that we have borrowed from the library or purchased ourselves. These are our genuine re-reads so all opinions are our own. What a great selection of books for the favourite’s shelf. It was great to see the Wee Page Turner in action with his books flipping away at the pages (with the occasional chew in between). He certainly has become The Wee Page Turner!